Sometime on Friday, Club Carlson, the FGP for Carlson Rezidor Hotels announced their 2013 Hotel Reward Night Category changes. They follow a long line of hotel programs who have announced changes already (Hilton, Marriott, Starwood etc.) this year. The difference here is that Club Carlson's changes are not that drastic. 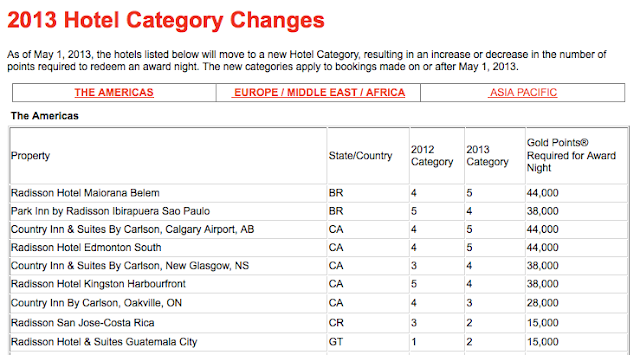 In Canada alone only 5 hotels are changing (3 are moving up 1 category, 2 are moving down a category, see graphic below for locations) and overall 97 hotels are going up globally while 151 are moving down. 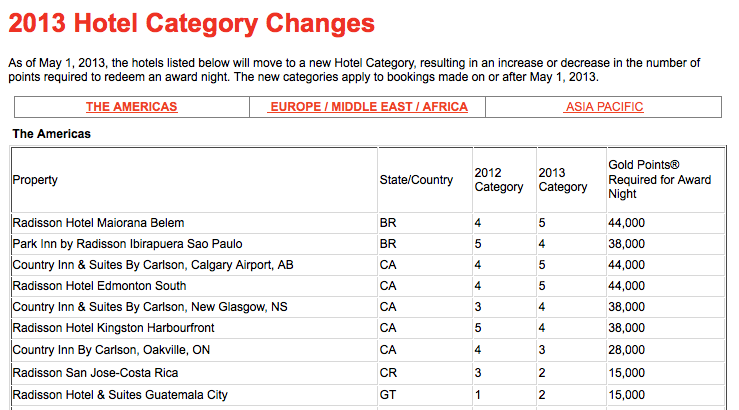 There are a couple of hotels moving up 2 categories which are big increases but overall the changes are minor.